“Little Merle” the pup that my son’s family got at Christmas has grown a bit. Here are a few shots from Thursday May 26th when I went down there to let him out and brought him to my back yard to play a bit. I knew my DIL before she and my middle son starting dating. She’d been in a bad relationship but before getting out of that, she had a terrible tragedy. A relative was babysitting. The relative was rather large, and decided to take a nap on the couch with my DIL’s four month old baby. The relative must have been very tired and so she fell into a very deep sleep. She rolled over and suffocated the baby. There are no words and I won’t even try but Brenlie’s birthday is May 27 and close friends and family gather for her party each year. She’d be five this year. She’s never forgotten. She’s just in a different realm, in Heaven, and the young children in the family are quite comfortable visiting her resting place, since they do that regularly. For her birthday and other more formal times when the family gathers, the children view it as normal to come together, celebrate, and even play there in the field below.There is a time of socializing and then later on a prayer…this year it was led by a pastor of their church. Poems and tributes were read by various family members. At the end Happy Birthday was sung and the balloons were on their way….full of tears, and love, and all on their way to another dimension…then some cupcakes and drinks and perhaps a treat such as bubbles to blow are brought out for the children before everyone heads for home. If you reference the above collage, the children have a lovely field to play in below. We were only there for an hour or so this year, however. It was just incredibly hot so the gathering broke up earlier than usual. Not far off from where Brenlie rests, there is a gargoyle sort of statue and one of the grandgirls was sitting there with her balloon, waiting for prayers and the balloon release. This is the time for the 17 year cicadas. If this doesn’t happen in your part of the country, a nice link with some info, photos and videos about them can be found HERE. They started appearing out by my mom and sisters location, in the ‘country’, several days before showing up in our area. Here in my neighborhood I could hear them a bit on Saturday in the early afternoon but did not spot any. However, later on I was at a graduation party. It was even hotter than the previous day : 92 in the shade. They have some huge old trees in the front of their yard and the cicadas were coming up out of the ground and climbing the trees and making quite the racket. It was rather surreal, because cicadas are the sound of late summer. Uncomfortable in the high heat and listening to cicadas, I started to feel as if we were celebrating Labor Day weekend, and not Memorial Day! Here in my yard, I took a shot the other day of the smokebush and spirea coming into bloom and the strawberries beginning to form. With the onset of this heat, the smokebush blooms turned a very light shade within two days of the earlier photo. The yellow rose bush is getting ready to bloom. She’s on the outside of the fence next to my parking space. She was planted three years ago and looks to be taking off a bit more after all of the rain that we had earlier in the month. Once these open they are such a pale yellow that they never photograph very well! I thought that I’d get some sewing / quilting done over the weekend between picnics and such. 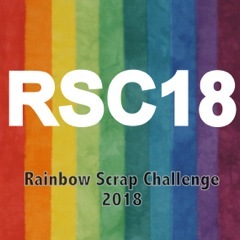 I do have an 1857 Album block that I’d started, and the best intentions to catch up on The Rainbow Scrap Challenge for this month. But I was digging through some books…looking for some fiction to re-read a bit, and came across a book that I’d purchased at a used book sale last summer at our local library that I’d never even opened! So I went from an original plan to have a casual re-read…of anything…to “The Expected One” by Kathleen McGowan which once started is hard to put down. If you like anything to do with theories about Mary Magdalene traveling to France, and Secret Societies, and mysteries and danger to the heroine trying to solve these, you would be like me…neglecting the sewing and finding it hard to put the book down :) It’s the perfect recipe for the lethargy that I feel since this heat wave hit. I was finishing up the binding early Thursday evening , May 26th on my red and green quilt. When I had completed the quilting on it I was in more of a hurry to get the next quilt ( Here ) prepped and ready to go, so I just took my time in regards to this binding. I have not been quilting for all of my life or anything…the applique blocks were a big deal to me when I started this. The block on the bottom left was the biggest challenge to me at the time with so many pieces. If you are new to applique it’s best to do what I have done and that is to start with big blocks and bigger pieces such as I did with this quilt. Go for 18 or 20 or 24 inch blocks to start. For the hand quilting, first I quilted various motifs in to the quilt, and then added the cross hatching.